A few days off. Sor­ry guys. I start­ed the morn­ing at Augs­burg shoot­ing the Min­neso­ta Du­als, a quad­ran­gu­lar in­volv­ing the four Di­vi­sion III wrestling schools in Min­neso­ta: No. 2 Augs­burg, No. 8 St. John’s, No. 18 Con­cor­dia and St. Olaf. This evening, I de­cid­ed to try some­thing new and shoot ten­nis. Hav­ing played ten­nis once 15 years ago and nev­er hav­ing shot it be­fore, it was quite a steep learn­ing curve. I hope to shoot it again soon. 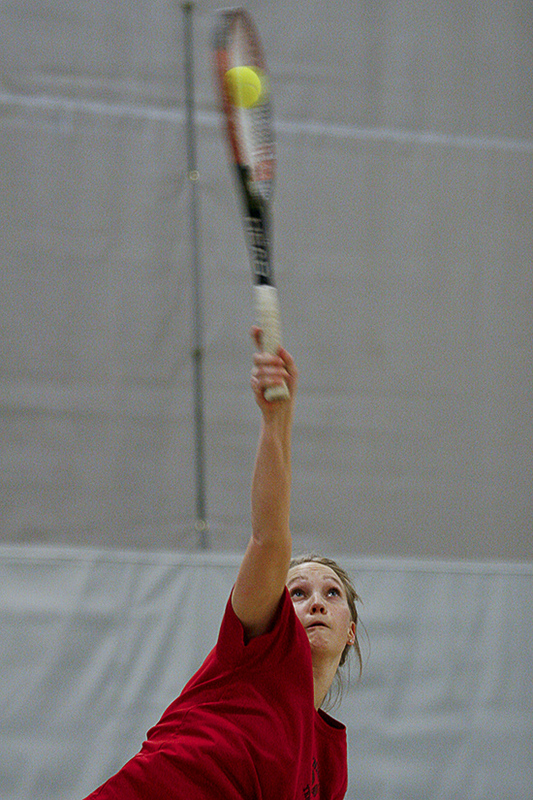 ST. PAUL, MINN. — Mar­tin Luther women’s ten­nis play­er Rachel Nie­mi serves the ball dur­ing a 1. Sin­gles match with Kate­lyn Glen­na of Macalester on Jan. 28, 2012 in St. Paul, Minn. Macalester won 8 match­es to 1 be­hind Genna’s 6–2, 6–0 vic­to­ry over Nie­mi. Up­date: Jan­u­ary 28, 2012 10:58 p.m. An ear­li­er cap­tion did not in­clude the name of the play­er, Rachel Nie­mi, or the re­sult of their match.